Seasonal Fishing From David Ronald Hartwell @ Big Dave's Slay City. Land based lessons. Late spring, small baits like mojara, pilchards and glass minnows begin to make their move and can be hyper abundant around flats and bridges with good patchy bottom. Sandy potholes in grass flats close to causeway shorelines are great places to find hordes of smaller baits at this time of year. In inside waters, trout, redfish, flounder and snook stalk these schools of relatively small baits. First light and dusk are the best times to fish around the bait schools with small white feather jigs, swim baits from 2-3 inches, or suspending twitch baits. Once the sun is up, the fish that still continue to stalk small prey in the shallows become increasingly spooky and can be frustrating to catch. 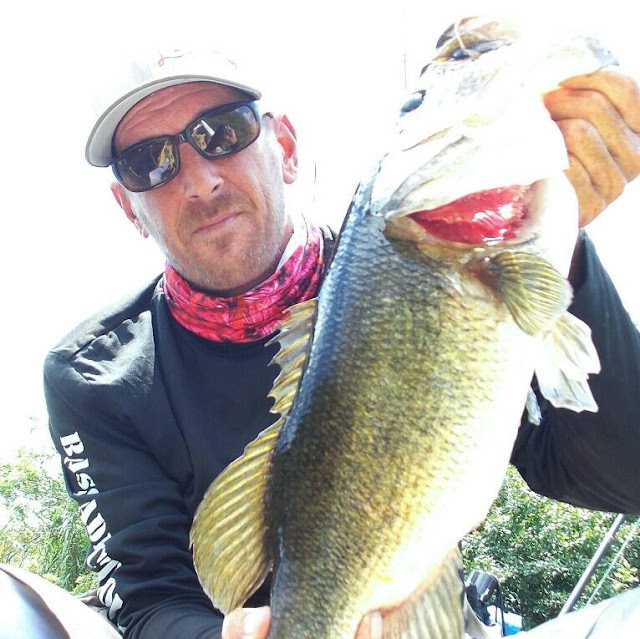 To stay on the bite, try switching to scented soft plastics or applying one of the many popular scent gels too your other lures. Downsizing your leader and increasing its length to a minimum of 3-4 feet and eliminating as much terminal tackle as possible will help catch finicky fish. With summer well on its way by late May, the smaller baits begin to mix with larger ones like mature pilchards, Spanish sardines, threadfin herring and cigar minnows and move out of local inlets. Where these baits black out the rapidly warming water, fast action with Spanish Mackerel, jacks, snook, juvenile tarpon and mangrove snapper is close at hand. Watching all of these species crashing through the dense schools of bait along jetty or shoreline walks is awe inspiring when cast against a rising sun. Small swimming plugs, soft jerk baits, spoons and top water lures are all good choices. Live bait is always a good option for fast action as well. Summer brings the largest push of bait of the year to the entirety of every inch of fishable water you can imagine. Mullet, greenies, pinfish, croakers, sardines, glass minnows and mojara are just a few examples of the great variety of bait species available at this time of year. With such an abundance of prey species close at hand, the variety of predators available to the angler is quite large as well. The biggest snook of the year, redfish, bonita, mackerel, several species of snapper, jacks, tarpon, barracuda, Goliath grouper and lookdowns are at their peak abundance during summer. With such a huge variety of fish available at this time of year, there are a nearly limitless array of tactics and strategies to make use of to get at them. Fly fishing, plugging, jigging, live baiting and chunking will all find use. Mangrove snapper can be best caught at this time of year around areas of heavy structure like bridges, jetties and rocky channels. Bottom fishing with fresh cut sardines and herring or live mojara to a couple of inches will take plenty of good fish. Keep your leader long and light to earn bites from these weary fish. Lots of bait around and snook feeding before sunrise . No keepers this morning , just one 25 inch on 6 inch Spooltek. Some tarpon here and there , Big runners on the end of the north jetty and moonfish . photo courtesy of David Ronald Hartwell@Big Dave's Slay City. Land based lessons. This morning a real nice Trout in the 8 - 10 lb. range was landed off the south jetty according to Tommy Turowski at the Sebastian Inlet Bait and Tackle Shop. Mangrove Snapper have been active and some decent sized Flounder have been landed from the rocks. Snook and Reds continue to hit, mostly in the evening hours. The water is warming up and it's time for targeting Snapper. Those predators love many types of live bait. Live shrimp, small finger mullet, sardines, pinfish, cut squid and small crabs will attract their attention. Those anglers who prefer artificials will find soft plastic shrimp and jerk baits work, as well as mud minnow and finger mullet, surface plugs and popping flies. Snapper prefer structure, so dropping your bait near the pilings of the jetty or casting near some mangroves is usually all you have to do. INSHORE: Snook season is winding down, and now is the time to try and catch that last slot fish or two for the season. Snook action has been good around Jupiter Inlet and local bridges over the past week. Look for the snook to bite best at night on the outgoing tides. 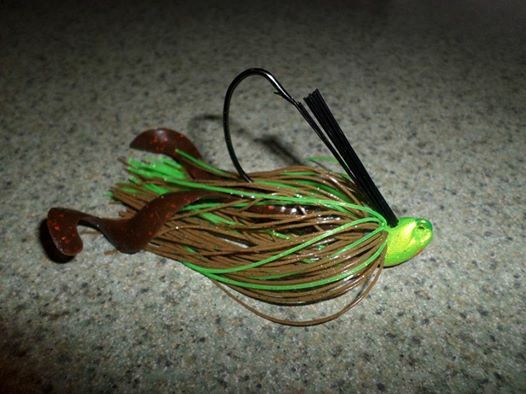 Flairhawk style jigs and swim baits remain solid choices for the snook right now. If the nighttime thing isn't for you, try the inlet during the day with live bait. The first part of the outgoing tide tends to be a good, but the incoming tide can work as well. 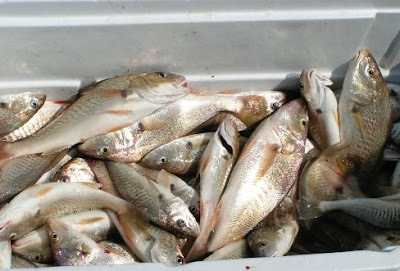 Live sardines ands croakers tend to be good baits in the inlet. 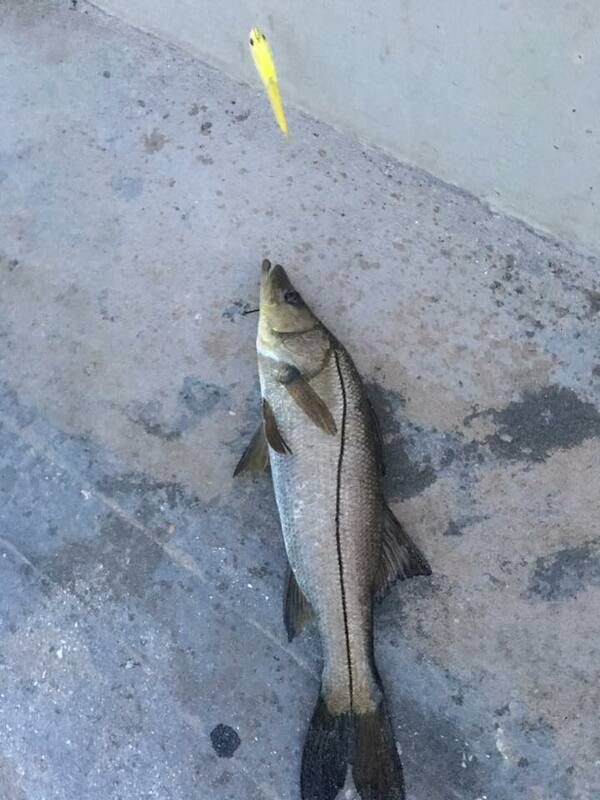 The Juno Beach Pier also has a fair number of snook hanging around if you can't find them in the inlet or bridges. Some nice jacks cruising the seawalls early in the morning, and provide some great excitement on topwater. Other inshore action remains spotty at best. SURF/PIER: Still a small handful of pompano being caught north of Jupiter Inlet, though it looks like pompano season is pretty much winding down. Lots of bait along the beach and around the Juno Beach Pier right now has the snook, jacks, and blacktop sharks fired up pretty good. Look for the fish to feed best during low light periods. Croaker are biting well in the first trough. Small live shrimp or fresh cut shrimp is the bait of choice for the croakers. The inshore bite has been great! There have been some pompano around the Stuart causeway, and reports of big trout on Sailfish flats. The Trout have been thick on the west side of the river around Harbor Branch with some Redfish mixed in, Gulp shrimp will work the best. Reports of Snook and Tarpon off the beach, best way to target these fish is with small white flies, Live pilchards, or any artificial lure that resembles a pilchard. Winds are blowing out of the North-Northeast at 14 mph, gusting to 16 and there is a moderate chop on the water. We have clouds building up offshore and NOAA is calling for a chance of showers. There were a few Spanish Mackerel landed on the outgoing tide this morning along with Lookdowns, Mangrove Snapper and few Jacks from the jetties. Some good sized Whiting are being landed in the surf according to Sarah at the Sebastian Inlet Bait and Tackle Shop. Flounder are hitting outside the channel and anglers have had good luck fishing from shore and the T-Dock. The snook fishing is great in the surf along the Treasure Coast, and permit and big jacks are also being caught. There are a few tarpon around as well. Although the bite lasts throughout the day, the best action is around the higher tide. 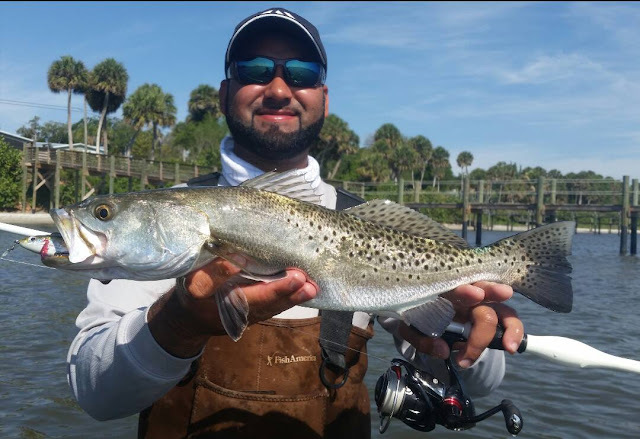 Those fishing in the Indian River are reporting a lot of trout on the east side. The redfish numbers are down, but some nice fish are still being caught. Big jacks and mangrove snapper are chewing around the docks and sea walls. Snook are really moving around now and be caught just about anywhere in the river. Snook have made their way into the surf along Palm Beach as well, along with a few tarpon. Jacks are also active and seem to be there throughout the day. Anglers fishing in the Intracoastal Waterway in central and southern Palm Beach County are still hooking snook at the bridges and dock lights at night, although they are moving toward the inlets as well. Small snapper and tarpon have also been hooked, and there are plenty of jacks around to keep you busy. It was a good week for bass fishing on Lake Okeechobee. Yes, the window is closing so for best results, be on the water as early as possible – preferably at first light. There are still good numbers being caught early, and it does pick up around sunset as well. Live shiners are working well, although skilled anglers are doing fine with artificial lures, too. While fishing the outside edges and back in the grass is always a good approach, there are bass being caught throughout the lake and rim canal. 05-25-16 WEDNESDAY: LOOKDOWNS, FLOUNDER, MANGROVE SNAPPER, REDS AND SNOOK. It's another lovely morning at the Sebastian Inlet. Winds are blowing out of the East-Northeast at 10 mph, gusting to 14 and there is a moderate chop on the water. There are no NOAA advisories this morning. Our photo today is courtesy of Paul Szoke of Palm Bay. Paul confirmed the Flounder run with today's photo. Paul landed this 22" beauty from the south side of the Park. A week ago he landed two 16" and one 18" Flounder. Paul has been nursing a broken femur and thought he missed the run, but says he's landed quite a few since he returned to fishing. He also reported many Lookdowns. On Tuesday Paul landed a large Mackerel and a 14" Mangrove Snapper and five shorts that were returned to the water. The Angler's for Conservation third annual Advanced Teen Anglers Camp is open for registration. The two-day camps are open to kids ages 12 -17 and are being held June 11 - 12 and July 9 - 10. The two-day camp will help young anglers fine tune the skills of any intermediate or beginning angler and serve as a building block on what it means to be a conservationist. Fish handling, safety, species, habitat, boating, kayaking, fly tying and more will be covered. The camp will take place at the Ted Morehead Lagoon House and costs $40, lunch will be provided. A certificate of completion and a goodie bag will be given to all who attend. Register at atac.anglersforconservation.org. Bait fish are coming in heavy to start your week. Spanish Sardines are THICK around the T bringing in some Bonitos, Snook, Barracudas, and Crevalle Jacks. In shore, there has been a steady flow of Croakers and Moonfish. As bait fish continue to come in as the Summer progresses, we'd like to remind all our anglers there is no cast netting from the pier. We stock a selection of sabiki rigs in our pier house for catching bait from the pier. We have another beautiful morning at the inlet. Winds are blowing out of the East-Northeast at 10 mph, gusting to 12 and there is a moderate chop on the water. NOAA is predicting winds to pick up this afternoon and there is a slight chance of showers and thunderstorms. We are happy to report that the bite has picked up with some spring and summer species. Quite a few Summer Flounder have been pushing through, we're starting to see Mangrove Snapper and of course we still have the big Reds that have been hitting in the evening hours. 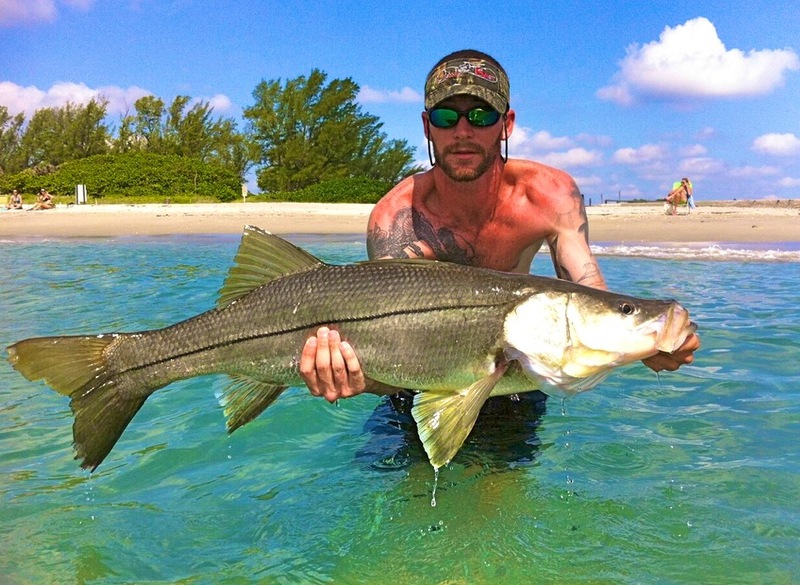 Snook are still active and you have a week left in the season to land that keeper. Snook season will close from June 1st - Sept. 1st for spawning season. All Snook will be strictly catch and release during the closed season. Our angler of the day is Jerry Connors of Melbourne who has become an inlet regular since moving to the area. Jerry landed this beautiful 41" C/R Snook off the north jetty. The Snook was released unharmed. Well, the rainy season arrived in torrential rains this week around the Treasure Coast. Seems like mother nature wanted to catch up on the dry weather all at once. We surely needed the rain, but it was a little overwhelming. There will be no end to the run off water being drained into the Saint Lucie and Indian River for quite a while. Expect a good chance of rain each afternoon. If the temperatures are a prediction, it will be another hot summer for us! Snook fishing has been good around the jetties and bridges for anglers. Snook season closes the end of May so you still have a short time to get that slot snook. Live bait, DOA Terror Eyz or feather jigs are good choices when snook fishing. You can find snook and redfish around mangroves and docks this month. DOA shrimp or live baits are also good choices. There are still big trout in the river. Fish sand bars or grass flats with the DOA shrimp or CAL shad tails when in these areas. Bear Point, Queen's Cove and Harbor Branch have all been good for trout lately. Top water lures are also effective this time of year. 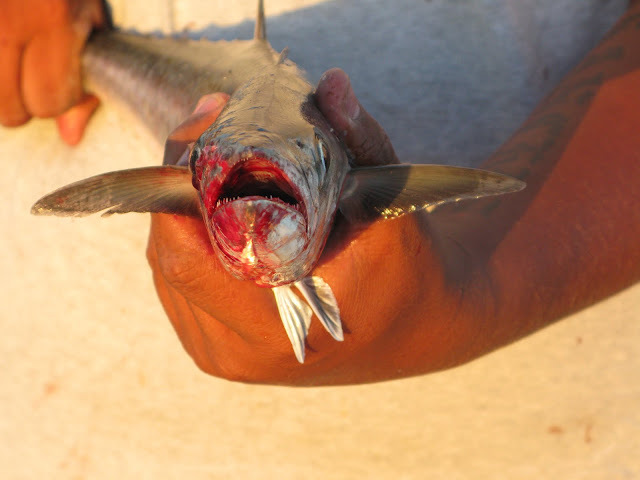 Jacks, mackerel and ladyfish have been around the inlets. 05-23-16 MONDAY: THE BITE IS PICKING UP! It's a real pretty morning at the inlet. We have West-Northwest winds blowing at 11 mph, gusting to 13 and there is a light chop on the water. NOAA is predicting winds to shift to the Northeast this afternoon with a slight chance of showers. Over the weekend the bite picked up according to Sarah at the Sebastian Inlet Bait and Tackle Shop. Some nice Reds, decent sized Flounder and Mangrove Snapper were landed. Surf fishing wasn't great but croakers are beginning to run along the beach which should improve chances. One can usually tell when the bite picks up, word travels quickly and more anglers magically appear on the jetties! Our angler today is Caleb Russell who landed the 28.5" C/R Red from the north jetty Saturday night. The Red was landed around 9:00 p.m. on live shrimp and safely released after the photo. INSHORE: Snook fishing has remained good this week, and should improve right on through the end of the season. The snook are making their way towards the inlets, and eating heavily as they do. Best bet on the snook remains area bridges at night on the outgoing tide. Big baits are still getting bites, so don't be afraid to chunk the big stuff. Flair hawk style jigs, swim baits, and big lipped plugs are all good choices now; as are live mullet. Daytime action on the snook is a little tough. If nighttime snook fishing doesn't work for you, be sure to fish low light periods of the day for best chance at banging a snook. Some nice jacks cruising the ICW right now for those looking to pull on some hard fighters. A few reports of some tarpon hanging around Palm Beach Inlet's south jetty. SURF/PIER: Looks like we are coming close to the end of pompano season, but it's not over just yet. Still a few pompano being caught north of Jupiter Inlet, especially during low light conditions or days the wind blows up a little cloudy water. Sandfleas, clams, and fresh cut shrimp are good bait choices right now. 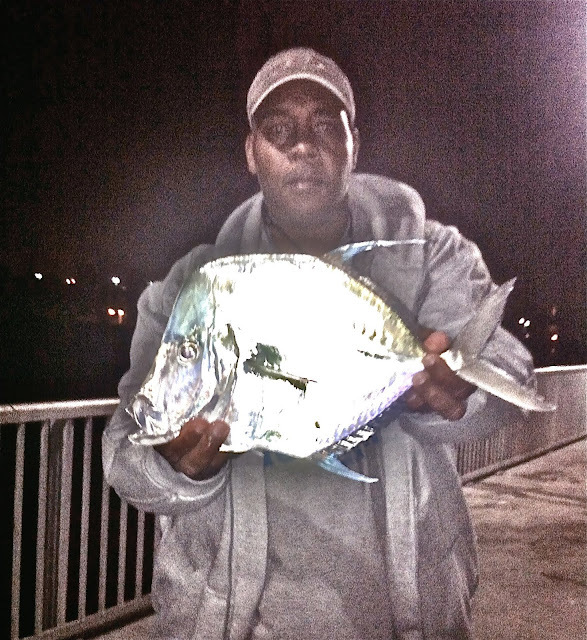 The Juno Beach Fishing Pier has also been picking away at some late season pompano. The pier is also producing a few slot size snook. Live shrimp and fresh dead stomped baits seem to be getting the most bites out of the snook. Croaker are biting small live shrimp or pieces of fresh shrimp in the first trough. Scattered schools of big jacks cruising the beaches. Did also have a couple day push of spanish mackerel around the pier. The beach fishing has been solid along the Treasure Coast. Whiting, croaker, permit, pompano and snook were all caught in the surf along Jensen Beach this week. The snook are still pretty small, but the numbers are growing. In the Indian River, the trout bite is still very good, and there are some nice tripletail being caught around the channel markers. The snapper action is great around bridges and other structure, and big snook are biting around the bridges. 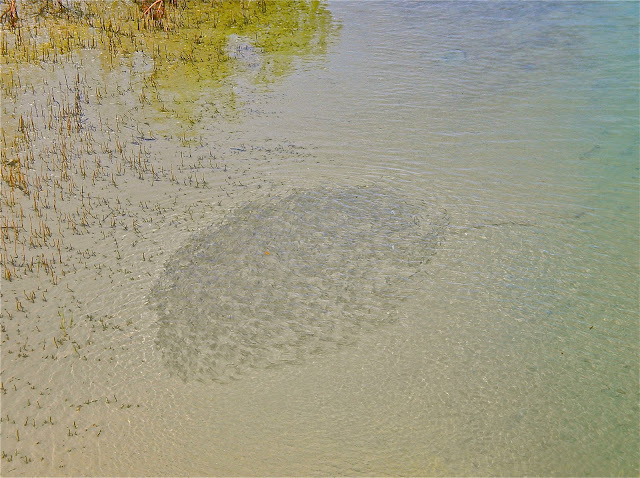 Smaller snook are moving through the flats, and tarpon are beginning to show up in the spillways and around North Fork. 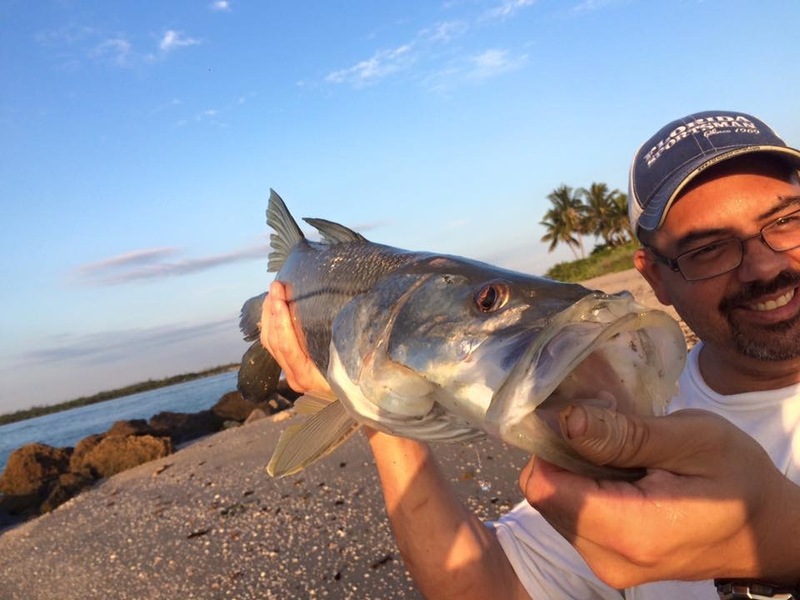 Snook are also biting around the beaches and inlet in Jupiter, along with pompano, ladyfish, permit and a few tarpon. Fishing the bridges of the Intracoastal in and around Jupiter is still great for targeting snook, while jacks, ladyfish and tarpon have been spotted throughout the area – bridges, flats, etc. 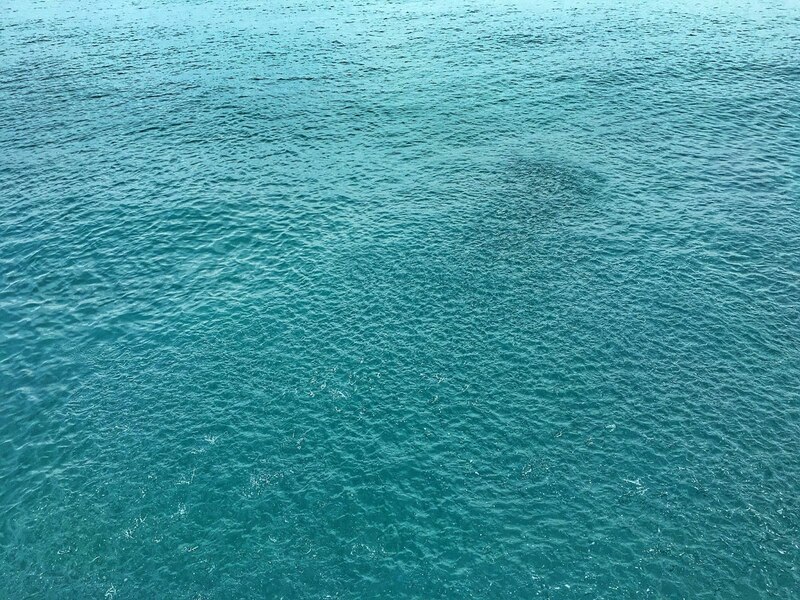 Jacks and tarpon have been reported in the surf along Palm Beach, along with the occasional permit. Ladyfish and croaker were also caught. 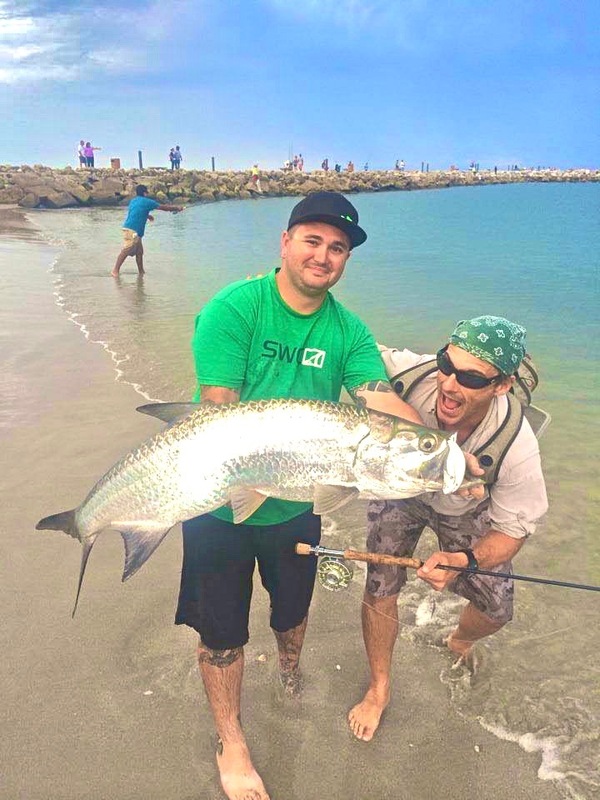 Tarpon and large snook have been spotted in front of the north jetty at the Boynton Beach Inlet, while croaker and sand perch have been snagged off the south jetty during the outgoing tide. Snook, snapper, tarpon and permit have also been caught from the beach, especially at night. Snook, jacks and snapper are all being caught around the bridges of the Intracoastal in central and southern Palm Beach County. This fishing remains solid on Lake Okeechobee. While the early-morning bite is best, you can catch bass well into the late-morning hours. It picks up again around sunset. Fish back in the grass and along the outside edges for best results. Live shiners are working better than artificial lures, but skilled anglers are getting their numbers either way. Some nice-sized bass were reported this week, including an 8-pounder up on the northeastern part of the lake. We have a gorgeous morning at the Sebastian Inlet. Winds are blowing out of the South-Southwest at 7 mph, gusting to 11 and the water is clean and calm. Winds will shift to the Southeast later today and we have a chance of showers and thunderstorms. We have seen a few nice surprises at the inlet the last few days. Richard Pearce's Permit was a beauty and there was also a keeper Cobia landed on a Gotcha lure from the north jetty on Wednesday according to Bob Green of Vero Beach. Oversized Reds and Snook are still hitting in the evenings and low light periods. 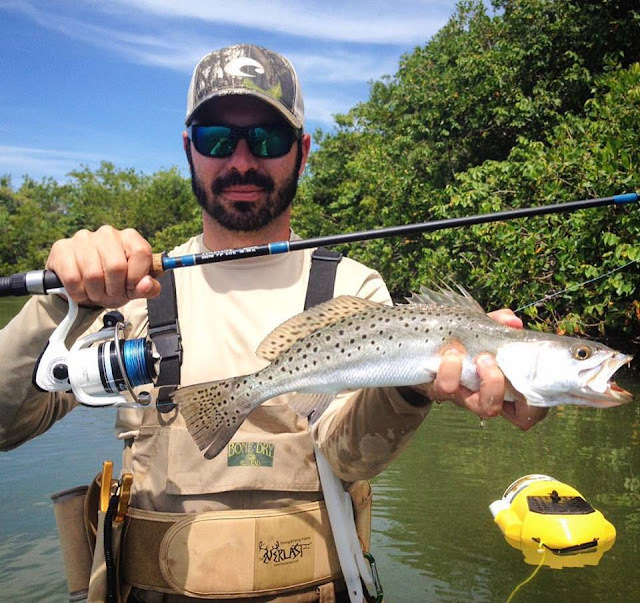 Scattered Blues, Jacks and Ladyfish are in the mix as well, but the bite remains slower than usual for this time of year. Our photo today is courtesy of Ed Gomiela. Dennis Haggerty brought in his big bull Red Friday night using cut Ladyfish. The big Red was difficult to hold onto, but they managed a quick photo and got it back into the water. The Red swam away unharmed. 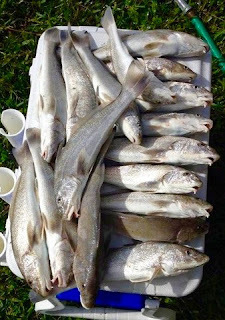 Inshore has been alright, with the recent Rainwater in Vero the bite has been tough, there are still a few Trout and Redfish around, live shrimp or pilchards will be your best bet to get the bite. The west side of the river in Ft pierce has still been great. 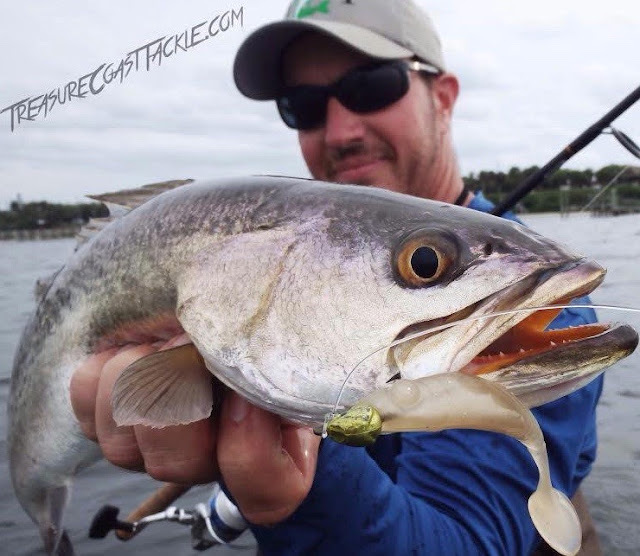 Slot Snook and gator Trout are still hitting topwaters and Shrimp imitations. The Snook have started moving out to the beach with reports of Slot and Overslot fish north of Ft. Pierce inlet and south of St Lucie inlet. there have been a lot of Spanish Mackerel of the beach in Stuart. 05-18-16 WEDNESDAY: LOOK, IT'S A PERMIT! We have overcast skies at the inlet this morning. Winds are blowing out of the South at 9 mph, gusting to 12 and there is a moderate chop on the water. Winds are forecasted to decrease this afternoon but thunderstorms are expected. The bite remains slow but our angler of the day gives us hope! Richard Pearce of Sebastian landed the beautiful 11.5 lb. Permit in our photo using his usual frozen bionic shrimp. Richard is one of the luckiest inlet regulars; he can walk out to the north jetty when nobody is landing anything and have something on the hook within minutes! Hopefully we'll see more of these delicious fish as the water temperature rises! We have an overcast morning at the inlet. Winds are blowing out of the Southeast at 12 mph, gusting to 14 and there is a moderate chop on the water. We have a chance of scattered showers and thunderstorms today, be sure to go prepared if you head to the inlet. 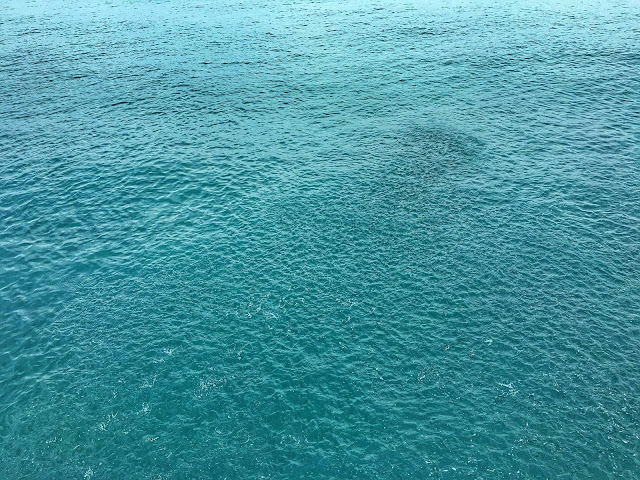 We received an update from Matt McKnight who reported a slow bite of Blues, Catfish and Nurse Sharks. Matt landed a protected Goliath Grouper on a mojarra that he immediately released unharmed, nice handling Matt. Reminder: Goliath Groupers have been prohibited from harvest or possession since 1990. They must be immediately returned to the water free, alive and unharmed. Photographs can be taken but only during the active act of release. Photographs or any other activities such as measuring the fish should not delay release in any way. Large goliath groupers should be left in the water during release. The skeletal structure of large goliath grouper cannot adequately support their weight out of the water without some type of damage. If a large goliath is brought on-board a vessel or out of the water, it is likely to sustain some form of internal injury and therefore be considered harvested. Removing smaller goliath groupers from the water to remove hooks is not necessarily a bad practice, but this process must be done with care, using proper fish handling techniques, and return the fish to the water as expeditiously as possible. Our photo today is courtesy of Matt McKnight who took the shot of an unidentified angler with a nice Redfish. Inshore the trout fishing has been steady with some nice fish around Bear point soft baits have produced the best. The snook bite has been steady with live bait around the bridges on the outgoing tide and on the south jetty with jigs. 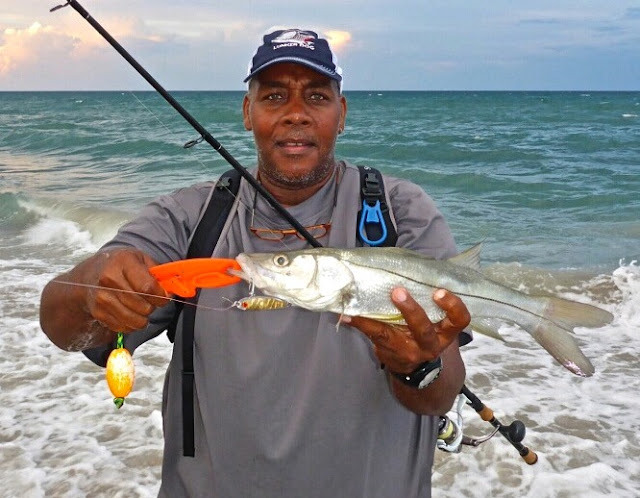 INSHORE: Snook fishing remains the highlight on the inshore fishing side of things. The last of the big springtime mullet and a little more stable warming trend in the forecast should have the snook very fired up for the last few weeks of season. Look for the bridges closer to inlets to produce on outgoing tides. The snook will be feeding heavy over the next few weeks before the summer moons start to have them thinking about other things. Jacks are around in good numbers and will keep things interesting when the snook don't want to cooperate. A topwater lure (like a Zara Spook) fished along seawalls at sunrise will most likely not go unnoticed by one of the two! Other inshore action remains a little spotty. Have been hearing a few sheepshead sighting reports (the actual catching of them is another story), and some fair sand perch action. SURF/PIER: Pompano action is slowing a bit, but still very good overall. Fish early and late fore best action on the pompano, and don't be afraid to try a variety of baits. Sandfleas, clams, and Fishbites remain the top producing baits; but this time of year fresh cut shrimp can also be a great producer. Some big schools of jacks cruising the beach right now if your looking for some tackle busting fun. Also a few good pods of tarpon reported cruising along the beach. Snook continue to trickle in along the beach and around the pier; and that should only continue as we move into the next few weeks. The Juno Beach Pier has also been catching a few kingfish. Good fishing right now, especially during low light periods of the day. Today's forecast calls for mostly sunny skies with a high near 85. The winds will be out of the southwest gusting to 10 mph becoming easterly in the afternoon. Throughout the weekend, daytime temperatures remain in the mid-80s with winds shifting to the west and north. There is a slight chance of showers and thunderstorms in the afternoon. The marine forecast calls for 2 to 3 foot seas and a light chop on the intracoastal. 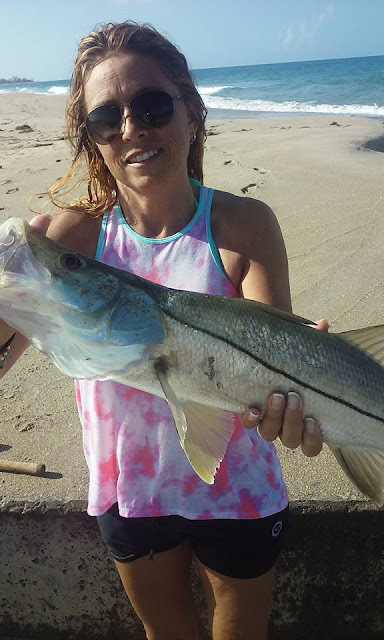 Sarah from the Sebastian Inlet Bait & Tackle shop reports one snook taken this morning with live shrimp on the north jetty, a light snapper catch with the incoming tide, and some blues and mackerels caught on spoons from the beach. Otherwise, the action has slowed for the moment. There has been Tarpon and Snook on the beach on North Hutchinson island, low tide is the best time to target them. There has still been some big Snook on the west side of the river but it has thinned out a lot. You can pick up some Redfish as well on the west side on a artificial Shrimp in a darker color or Doa shad tails in darker colors as well. The Trout bite has still be steady up by round island. The night time Snook bite has been ok on the south jetty. We have another gorgeous morning at the Sebastian Inlet. Winds are blowing out of the Southeast at 2 mph, gusting to 4 and there is a light chop on the water. There are no NOAA advisories this morning. The action is slow during the daylight hours. Scattered species in ones and twos are making it over the rails for patient anglers including Blues, Jacks and Lookdowns. Baitfish are scarce right now and that is contributing to the slow bite. The night bite has been better for oversized Snook and Reds. Please read the FWC catch and release information at the top right of this page. Please handle all C/R species with care. Our angler of the day is Jerry Connors of Melbourne. Jerry has become an inlet regular in the short time he has lived in Brevard County. Jerry likes fishing evening and early morning hours and usually does well with Reds. Jerry arrived at 5:00 a.m. and reported the only thing biting was the no see 'ums. When the outgoing tide became strong, he landed three oversized Reds and lost one. The Reds measured 32", 34" and a huge 48" that was hard to pick up. Jerry was able to remove several old hooks from the fish before he released it to fight another day. 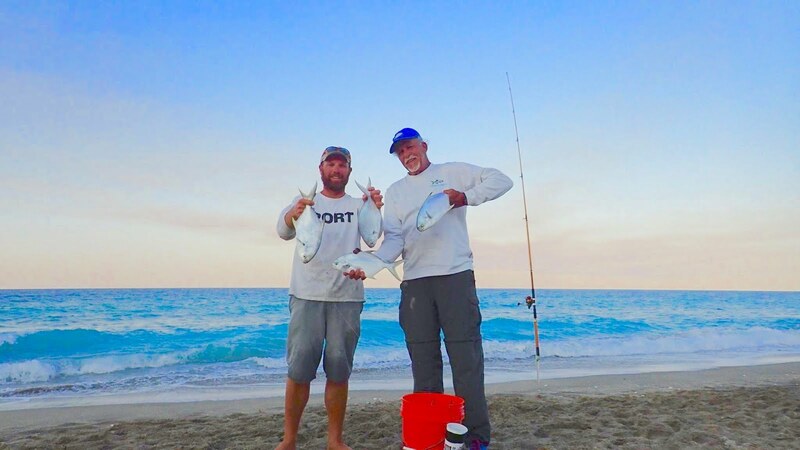 The beach bite has been excellent along the Treasure Coast, with big croaker, snook and even some late-season pompano all being caught on the higher tides. Snapper, snook and jacks are all hitting inside the St. Lucie Inlet as well. Live mullet are working well. Trout and redfish are being caught on both the east and west sides of the Indian River, with the best action taking place near the power plant. The snook bite has been really good around the bridges, especially at night, and jacks up to 20 pounds have also been reported. Permit and snook are chewing in the surf along Jupiter, and snapper, snook and jacks are all being caught in the Intracoastal Waterway in and around the Jupiter area. The surf fishing has been relatively quiet in central and southern Palm Beach County, but there are definitely a lot more snook cruising around, and tarpon are beginning to roll through as well. Permit are also in the mix. The best bet for hooking up seems to be near the Palm Beach and Boynton Beach inlets. While snook are still plentiful around the bridges and docks of the Intracoastal throughout central and southern Palm Beach County, big tarpon have been spotted around the channels. They have also been reported in the flats along with bonefish, snook and jacks. Small snapper are around as well. It has been an excellent week for bass fishing on Lake Okeechobee. With the cooler weather early in the week, the fishing window opened up a bit and allowed for some nice catches throughout the day and night. Being on the water at first light is still the way to go, but plenty of fish were caught during all morning, afternoon and evening hours. The outside edge is still working best, and getting back in the grass is key, too. Live shiners still hold the edge over artificial lures, but the bass have definitely been hitting both. We have a beautiful morning at the inlet. Winds are blowing out of the Southeast at 2 mph, gusting to 5 and there is a light chop on the water. There are no NOAA advisories this morning. We have a small swell that some surfers are taking advantage of this morning. It looks like a perfect day to get out and enjoy the great outdoors! Although the bite has been slow form the jetties, anglers fishing in low light periods are still landing Snook and Reds and some Lookdowns. The flats are producing Tarpon, Blues, a few Mangrove Snapper and Jacks. Our angler of the day is Stephen Randall of Mars Hills, NC. Stephen was visiting and kayaked near Monster Hole with his brother-in-law and a friend. The men had a great time catching good sized Blues on Kast master spoons. Stephen reported a couple of sharks paid them a visit while they were there. An eight foot Bull swam between two of the kayaks and a smaller shark went after one of the Blues on the line. The beach has had a few tarpon around with some snook in the bait schools starting to show up. Inshore the trout bite has been good around Bear point to Midway road with a few nice fish at first light on top water soft baits have been working well after the sun gets up. The snapper bite on the channel ledges have been good with live shrimp and small white baits. The south jetty in Ft pierce has had some snook at night with jigs and some nice flounder with live shrimp during the day. Redfish will be our main target throughout the month of May. 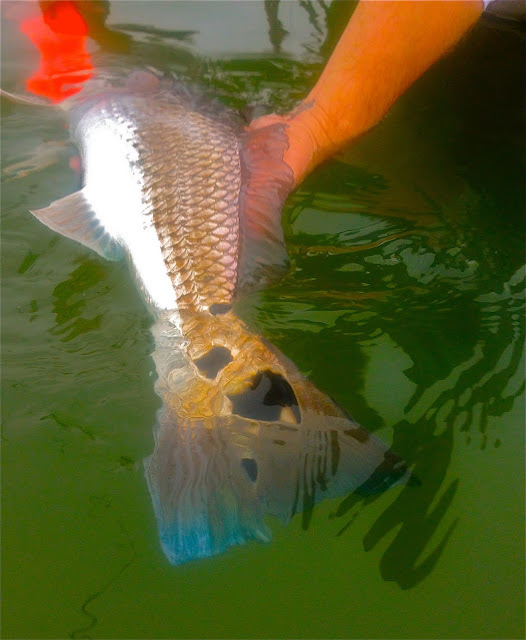 The past several years have bought us schools of slot sized redfish along the Indian River. Most of the fish we have caught have been in the 18 to 30 inch range. The mangroves have produced lots of redfish action again this year. They have been sunning on the flats and May gets their blood pumping and turns on the feeding. I always have three lures ready during May…DOA shrimp, CAL jerk baits and top water lures. Gold spoons and the DOA Airhead will also be great additions to the arsenal when fishing for redfish. As the fish school up, look for them around the edges of the flats. Most of the river here on the Treasure Coast has been holding redfish and you should be able to find some on your favorite flats. I tend to enjoy the east side of the river, but we have found many on the west side as well. Snook fishing in the early mornings will bring some rod bending action as they head up on the flats for an early morning or late evening meal. 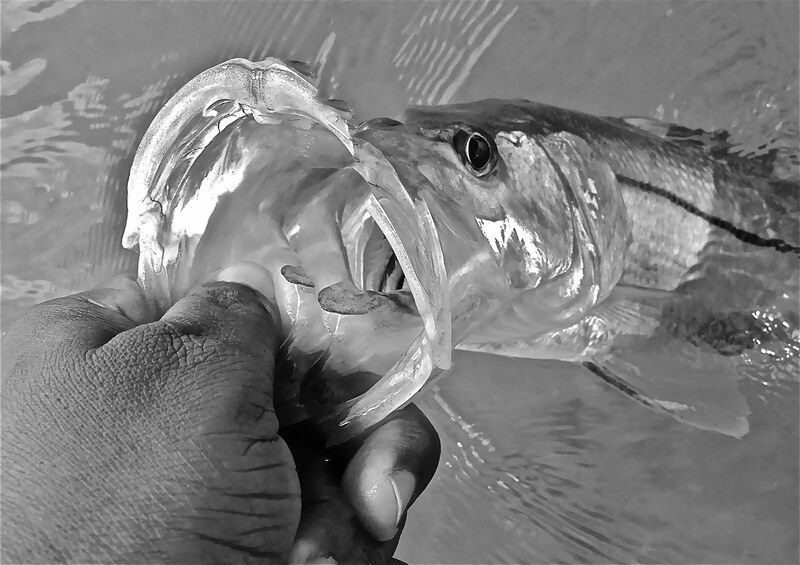 Top water lures, Baitbusters and DOA shrimp are all great lures to tempt a snook into biting. We have been broken off numerous times by big snook under the mangroves. Docks will also hold snook lurking around for an easy meal. Live shrimp is hard to beat around the docks. In the inlet areas, try around the seawalls and bridges with live bait, Terror Eyz, feather jigs or deep diving plugs. I love early morning for great snook fishing opportunities! Snook season will close May 31st. We have a gorgeous morning at the inlet. Winds are blowing out of the Southwest at 2 mph, gusting to 6 and there is a light chop on the water. Winds are predicted to shift to the East later today. There are no NOAA advisories this morning. The action was slow from the jetties this weekend according to Sarah at the Sebastian Inlet Bait and Tackle Shop. There were quite a few Bonnethead Sharks landed and released. Bonito have started to show up in small numbers and the rest of the catches were stragglers of Black Drum, Sheepshead and a few Flounder in the back. The beaches produced some Spanish Mackerel, Blues, Jacks and Pompano. Thanks Sarah! Our angler of the day is Lindsay Rowland of Malabar. Lindsay landed her beautiful C/R Red on the flats on her birthday, May 5th. We have a gorgeous day at the inlet. Winds are blowing out of the Northwest at 10 mph, gusting to 17 and there is a moderate chop on the water. We're experiencing extreme tides due to the new moon. NOAA is calling for small craft to exercise caution for winds. Always check the NOAA forecast prior to boating. The action was pretty quiet this morning on the north jetty. Early in the morning hours a couple of oversized Reds were landed and released. Two or three Snook hook-ups occurred but the fish broke off before they could be brought over the rails. A few Lookdowns were landed but that was it for the morning. Mike Ricciardi of Vero Beach fished the north jetty yesterday morning until early afternoon and reported a slow bite, but better than today! Lookdowns were active and Blues came in around mid-day. Four or five oversized Reds were landed and released; Jacks in the three to five pound range were landed. Two slot Snook were landed before daylight by inlet regulars Tony Swiderski and Chuck Fischer. Mike landed his first Mangrove Snapper of the season while free lining shrimp that was meant for a Snook! Thanks Mike! Our first photo today is courtesy of Jerry Connors of Melbourne. Justice Schara of Melbourne helped Jerry pull in a few of his Reds early Sunday morning; he hadn't had a hit since he'd been there. Jerry shared some of his live shrimp and showed him a few techniques and within a few minutes he landed his first Red ever! Way to go Jerry and great catch Justice! Photo two features Jerry Connors of Melbourne with a big bull Red he landed in the early hours of Sunday morning. The Red was released unharmed after the photo. Very nice! We have a gorgeous morning at the inlet. After yesterday's deluge, the sun is shining and skies are blue! There is a moderate chop on the water and NOAA is calling for small craft to exercise caution. The bite remains slow from the jetties. Anglers fishing the rivers and canals have had better luck, particularly with Speckled Trout. We received an update from Jerry Connors of Melbourne who went out on the north jetty at 2:00 a.m. Jerry reported high winds but after about thirty minutes he landed two Reds back to back. The first was 29" and the second was 32" both fish were landed on live shrimp and returned to the water unharmed. 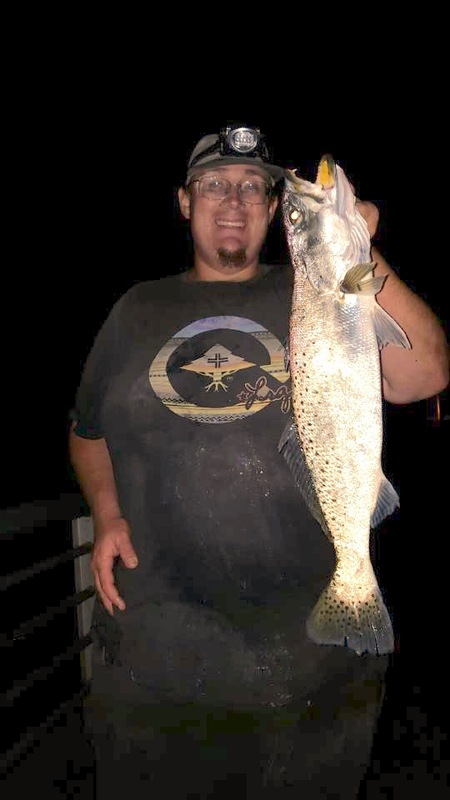 There was no action for the next hour or so, he worked his way to the bridge, still no hits until 6:00 a.m. when he landed two 26" Snook back to back then he settled into another lull. Around 7:30, he landed a 31" Red and at 8:00 he landed a very angry 41" Red which were also returned to the water. After that big bull, Jerry called it a day and headed home. Folks, it's come to my attention that very few people know the pleasure of look down fishing. It's high time that changed. The look down is a fi sh unlike any other. This curious critter is a slab sided silver fish that rarely gets to more than two lbs but can pull like a truck on appropriate tackle. It's active both day and night and is a top predator in its own right. Look downs are one of my favorite warm water targets for a few different reasons. They'll chase just about anything they can fit in their mouth, they can be a challenge to master and they are seriously good eating fish. Targeting lookdowns is best done from the beginning of may through early September with the peak bite centering around the full moons. They can be found around docks, bridges and jetties but have a preference for flowing water and like to hang around vertical structure adjacent to a substantial dropoff. They mostly feed on small baits like juvenile greenies, glass minnows and small shrimp though I've caught plenty of bigger fish on mojara or sardines while snapper fishing. To catch these guys, you'll want to keep your tackle light. This is finesse fishing at its finest. I like a soft rod and tiny reel loaded with 4# mono. Small jigs ranging from 1/16-1/8 of an ounce will get the most strikes. White is the best color most of the time but in dirty water I like orange, pink or chartreuse. Speaking of dirty water...I find that some of the best action I've had with these fish is after a few good rainy days. When the outgoing tide turns dark at an inlet and meets clean ocean water, the resulting edge creates a serious ambush point for feeding lookdowns near the slow water at the end of most jetties. These fish will often be tight to the rocks right on the edge of the tide line. Work your jigs by casting toward the current edge and letting it touch bottom. Keep your rod high and work the jig with a series of no more than two or three short twitches. Reel up slack and repeat until you reach the surface. When you hook a fish, make a note of it. Generally, lookdowns will school at a level depth so once you hook one, there will be more at the same depth. This is much like crappie fishing in freshwater. It's important to keep presenting your jig above the fish because they feed by attacking from below. Stay tuned for part two with some nice pics coming with it in the near future! We have a wet day ahead of us today. This morning winds are blowing out of the West-Northwest at 9 mph, gusting to 17 and the water is very calm. Winds are predicted to pick up late this afternoon and NOAA is calling for small craft to exercise caution at that time. Showers and thunderstorms are likely throughout the day so be sure to pack your wet weather gear if you head to the inlet today. Rainy, cloudy days can sometimes invigorate the bite, throw on some rain gear and give it a shot. The action has been slow off the north jetty so maybe today is the day it turns around. With the water temperature rising, we should start to see snapper starting to show up. 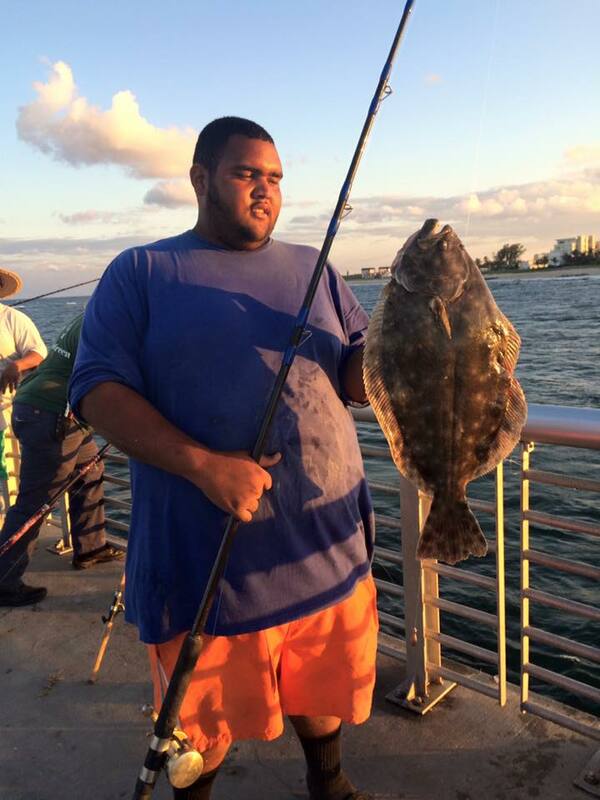 Our angler of the day is Mike Zambrano of Melbourne. Mike was kayak fishing at Long Point when he landed the beautiful 26.5" Red. Mike was using a Gulp swimming mullet to land the slot fish. Spanish mackerel and bluefish are still being caught in the surf along Jensen Beach but the numbers are definitely down. There are quite a few snook at the beach now, and the croaker bite has been great. The west side of the Indian River is still producing a hot redfish bite, and there even some being snagged on the east side near Vitola Park, along with trout and a few tarpon. Snook are still holding around bridges and docks, but they are also thick around channel markers. Tripletail and flounder are also chewing at the channel markers. Snook are cruising the beaches in Jupiter as well, and there are also ladyfish in the mix along with the occasional pompano. Tarpon are also starting to roll in the surf. Whiting and croaker seem to be holder around the mouth of the Jupiter Inlet. Jacks and snook are chewing in the surf along Palm Beach, and a few Spanish mackerel can still be found. Those fishing in the Intracoastal Waterway in the Jupiter area are reporting snook at the bridges and docks at night, and plenty of jacks. Anglers fishing in the Intracoastal from Palm Beach down through Boca Raton are seeing tarpon rolling through the channels and feeding on the flats. Permit and bonefish are also showing up around the flats. Red drum, snook, jacks and sheepshead are all holding near the bridges as well. Snook, mangrove snapper, permit and tarpon are all biting in the surf along Boynton Beach, especially near the inlet. The bass bite has been pretty good on Lake Okeechobee this week. Good numbers and sizes of bass are being hooked along the outside edge and back in the grass. You can catch them out in the open water as well, but for best results, stay toward the grass. As the temperatures rise, the window for catching bass gets smaller. You can still have success throughout the day and night, but the biggest action is definitely taking place early in the morning at this point – first light. It does pick up a bit around sunset as well. Live shiners still get the nod over artificial lures, but anglers are catching fish either way. We have another pretty morning at the Sebastian Inlet. Winds are blowing out of the South-Southeast at 6 mph, gusting to 11 and there is a light chop on the water. There are no NOAA advisories this morning but we have a chance of showers this afternoon. We received an updated from inlet regular Mike Ricciardi of Vero Beach who fished the north jetty yesterday from 8:00 - 2:00. Mike reported a very slow day. Mike went armed with sand fleas, live shrimp and mojarra but the best he could do was the 22" Black Drum in our photo today, a gift from the "fishing gods" as most of the Black Drum have disappeared. Mike saw two Whiting and three small Sheepshead come over the rails and one Snook that was hooked up but lost due to dead line in the water, the angler was using pinfish. We have a windy day at the inlet. Winds are blowing out of the Southeast at 16 mph, gusting to 19 and there is a moderate chop on the water. There are no NOAA advisories. Over the weekend the bite was hit or miss. A few Black Drum and Sheepshead came over the rails, a couple of Pompano and Snapper were landed and Summer Flounder were landed outside the channel. Yesterday, Blues were hitting spoons on the outgoing tide. Reds and Snook have been biting better at night according to Sarah at the Sebastian Inlet Bait and Tackle Shop. We received an update from Jerry Connors of Melbourne who fished the north jetty on Thursday night. Jerry took a bunch of jumbo shrimp with him and started fishing the inlet side about half way out. Right after dark he landed a 41" C/R Snook. Jerry said the Ladyfish were thick and it was hard to keep them off the line. He slowly worked his way to the end then all the way to the bridge and back. When he returned to the end he worked the area without interference from the Ladyfish and landed a 29" slot Snook. Working his way back toward the parking lot, he found the Reds; he landed five in a row with the third one being a 26" slot fish, his first keeper in years! From 3:00 a.m. to sunrise the Redfish bite was hot, he lost count of how many he brought over the rails. Sounds like a great night. Way to go Jerry, thanks for the update!